Trailhead and parking area are on Ferncroft Road in Albany, NH. Ferncroft Road leaves Rt. 113A at a sharp curve in the road, 6.7 miles north of its western junction with Rt. 113 and 6.5 miles north of its eastern junction with Rt. 113. The large dirt parking area is half a mile down Ferncroft Road, on the right. Although renown for its viewless summit, Mt. Passaconaway actually possesses many fine viewpoints around its summit cone. It is in the center of the Sandwich Range, on the north side of the great cirque known as The Bowl. It is most easily accessed via the Dicey's Mill Trail, which runs through the center of The Bowl. Unlike the treacherous trails on nearby Mt. Whiteface, Dicey's Mill Trail climbs for most of the way at easy to moderate grades. It begins at the parking area at the place called Ferncroft. From the parking area, walk out to the road and follow it for 0.3 miles (to the north - opposite the direction you drove in from), then continue straight where Blueberry Ledge Trail crosses a bridge on the left. Follow the road up a driveway and into a field, then finally enter the woods at the end of the field. The trail soon approaches the Wonalancet River, and 0.3 miles after entering the woods, passes a bridge over the river on the left. The trail then travels at mostly easy grades for 1.1 miles into the floor of The Bowl to a junction with Tom Wiggin Trail on the left. In another 0.4 miles, the trail crosses a tributary of the Wonalancet River, passes by an open grassy area, and runs beside a large boulder. It soon begins ascending the east side of a ridge in the middle of The Bowl. Grades are easy to moderate and the trail is never very rocky for the duration of the climb. After an uneventful 1.4 miles, pass a junction with Rollins Trail on the left. In another 0.2 miles, bear right to follow East Loop as Dicey's Mill Trail turns left, just after crossing a tiny stream. You will return on the top of Dicey's; following the loop counterclockwise attacks the most difficult part first. Follow East Loop for its entire 0.2 mile length as it crosses the slope with a few small undulations. Arriving at Walden Trail, turn left and face a tricky rock scramble. For the next half mile, the trail races up terrain like this, with a few minor reprieves. Near the top of the climb, the grade eases as the trail swings around a plateau just east of the summit. It then passes by the first viewpoint, an exceptional vista to the south overlooking the Bowl. On the left side, you can see the ridge sometimes called the Wonalancet Range, with the circular Ossipee Range in the distance above. Looking out to the center, you can view Lake Winnipesaukee and the Belknap Range. On the right side of the Bowl is nearby Mt. Whiteface. Now very near the summit, the trail hops up over a quick steep pitch and leads out to the next viewpoint, on a flat ledge looking out to the east. From here, you can see from northeast to southeast. The best feature of this vista is its perspective over Mt. Paugus and Mt. Chocorua. At this point, you are only about a hundred feet from the summit. As you approach the end of Walden Trail, look for a spur path on the right, marked with a view sign. This one requires some effort to enjoy - it is about 0.3 miles and 320 feet down - but this magnificent viewpoint should not be passed over. The spur path drops down through the forest to a tiny clearing which commands an incredible sweeping vista across the Kancamagus Highway valley. The panorama starts at the Franconia Range on the far left (the Kinsmans can be seen just to the far far left), encompassing the entire ridge from Mt. Flume across Liberty, Lincoln, and Lafayette to Mt. Garfield. The low, sprawling Mt. Hitchcock can be seen below. Next over are the dominant Mts. Hancock and Carrigain, sheltering the cliffs of The Captain between. Behind them can be seen Twin Mountain and Zealand Mountain. Below and to the right of Carrigain is the wide Green's Cliff. Behind, on the east side of Carrigain Notch, is the Nancy Range, with the more distant Willey Range behind that. Next over, the iconic Presidential Range stretches out, with the Southern Presidentials and the Montalban Ridges prominent. Below is Mt. Tremont. To the right of Mt. Tremont is Bartlett Haystack, with the Carter Range behind. Between Haystack and the next mountain in the Moat Range, Bear Mountain, you see small and cliffy Iron Mountain. 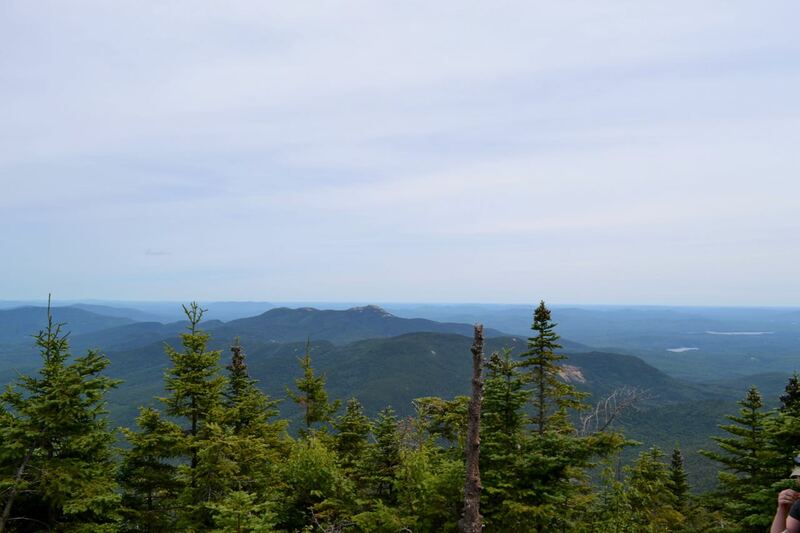 Further over to the east is the rest of the Moat Range, Table Mountain, Attitash Mountain, and Moat Mountain. The Kearsarge North area is behind this. Very close in the valley unrolling directly below your perch are the two small ledgy peaks of Potash Mountain (left) and Hedgehog Mountain (right). Return to the Walden Trail and continue a few feet to where it ends and a spur goes left to the viewless summit of Mt. Passaconaway, marked with a tiny cairn. Once you step on the summit, continue past the end of Walden Trail to Dicey's Mill Trail. Quickly reach the final viewpoint of the loop. Here, there is a restricted directional view to the northwest. Mt. Tecumseh is seen through the trees to the far left. Next over are the Tripyramids, seen from the "back" side (the east side - opposite the famous slides), with the tip of Mt. Moosilauke peering over the pass between the middle and south peaks. You can also see some of the terrain that was visible from the much better northern viewpoint. It is 0.7 miles down Dicey's Mill Trail to close the loop around the summit - the first part is a moderate, rocky descent through many switchbacks. Toward the bottom section, the trail eases a bit. It arrives back at the junction with East Loop after passing a former campsite by a stream.